Trees not only give us oxygen and shade, but they also benefit wildlife and add beauty to nature. And the best part is that most of the time, they do all of this without requiring anything from us. However, this is not to say, trees don’t get sick. Just as with all living things, trees are also susceptible to disease and sickness, and when they get sick, they not only become eyesores, but they also pose a risk to you and your property. 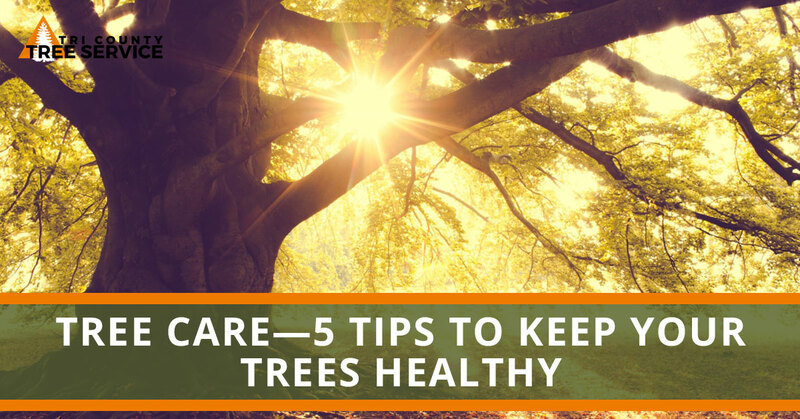 Though you can never truly prepare for extreme weather that can take its toll on trees, there are some things you can do to keep your trees in good health. Read on to learn about some of the ways you can ensure that your trees are healthy, strong, and beautiful. If you need help with your tree care, don’t hesitate to contact Mississippi’s Top Rated® Local Tree Service Provider. At Tri County Tree Service, we have the experience and expertise to diagnose your tree, treat it, and provide proactive care to manage the long-term health of your trees. Before you can treat your trees, you must first know their needs. This starts with first being able to identify the type of tree you are growing—there are a number of handy tools out there to help with this task; the Arbor Day Foundation’s online key is especially helpful with this. After determining the type of tree, you can then go on to answer more specific diagnostic questions: what is the tree sensitive to? Is it drought-tolerant? What are its watering and soil preferences? If you feel overwhelmed by this task, contact our professional tree care providers. They can help properly diagnose your tree. A healthy root system is an essential part of a healthy tree, and key to a healthy root system is healthy soil. Protecting and monitoring the critical root zone of your tree is the surest way to make sure your roots are staying healthy. In this zone—an imaginary circle that encompasses the area of the ground where the tree’s branches extend—roots are sensitive to disturbance. Aim to never compact or make significant changes to the soil in this area. Look at a tree’s bark as its armor. Naturally, when its armor is removed or damaged, it becomes more vulnerable to fungal and bacterial infection. The number of ways to damage a tree’s bark is seemingly infinite. However, there are a few common ways to harm the bark. Avoid the following: damaging the bark with lawn equipment and vehicles, and avoid letting branches or other objects come in direct contact with the tree, and, therefore, wounding and stripping the tree of its bark. Making sure your trees are receiving the right amount of water is essential to overall health. Even mature, well-established trees are not impervious to drought and improper watering. Remember to give your tree a much-needed drink during the hot, dry summer months, and lay off the watering in the dormant winter season—unless you recently just planted a tree. Also, remember that infrequent soaks are better than regular mistings. If you keep your trees in good health, they will be more resilient to strong winds and able to persevere if a drought sets in. Tree pruning is a great way to foster growth for developing trees and improve the shape of mature trees. However, through proper pruning can be greatly beneficial for a tree, improper pruning can be equally as bad. Late fall and winter is a great time to prune your trees. If you need help with pruning, contact Tri County Tree Service. We can not only prune your tree, but if we find that your tree can’t be saved or that there is a limb posing a threat to your home, we can safely remove all or parts of your tree. From the initial free estimate to the final clean-up, we take pride in our attention to detail, customer-oriented focus, and quality tree services. Whether you need an emergency tree removal or tree care advice, we are your go-to tree service in Jackson, Mississippi. Contact us today to get your free estimate!